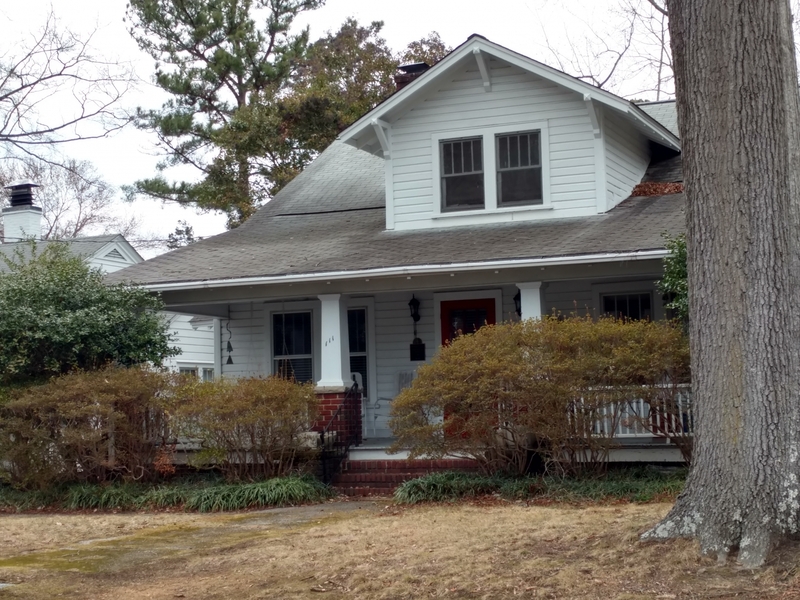 In 2016, the owners of this home applied for and received a historical plaque from Preservation Durham. The following information comes from the plaque application which was prepared by Jan Hessing and Tom Miller. In September of 1924, Dillard sold two lots, l l and 12 in Block C on Elerby Street, to J. L. Glosson, a builder. In 1925-26, Glosson built the current house on the lots. He sold the property to Laura V. Cash soon after the house was finished. He may have begun the house as a speculative venture, but it is likely that he completed it for Mrs. Cash. Laura Cash was the widow of Rev. Ben J. Cash of Ayden, North Carolina. She came to Durham with her family to occupy the Ellerbee Street house. She was born in Pitt County about 1876. According to the 1920 U.S. Census, the Cashes were a farm family living in Pitt County near Ayden. In addition to Ben and Laura Cash, the census lists children Willie T. Cash, age 14, Oliver Cash, 11, Laura May Cash, 8, and Doris, just three years old. The family first appears in the Durham City directories in 1927. By that time, Laura is identified as a widow. The Cashes' address is listed as 303 Ellerbee Street which is certainly the subject property. The numbers assigned to the homes on Ellerbee changed several times over the years as the street was extended and more houses were built. Laura's now adult sons are both identified as "batterymn” working at Rochelle's Battery and Ignition Service at 325 Chapel Hill Street downtown. Just why the Cash family moved to Durham from Ayden is unknown. Perhaps it was because the Cash sons found work in town. The 1930 U.S. Census lists the occupants of the Cash home as Laura Cash, her son, William Thomas Cash, his wife, Helen Cash, and Laura's daughter, Laura M. Cash. By this time, Oliver had married (Zeffia) and moved to Eva Street in East Durham. What had become of baby Doris in years following the 1920 census is unknown. The Great Depression was hard on the Cash family. Mrs. Cash, who had not been employed outside the home prior to 1930, got work as a saleswoman. Her health began to fail. She died on June 10, 1933. Her death certificate lists the cause as pellagra - a terrible and often fatal disease characterized by skin eruptions, diarrhea, dementia, and heart failure. It is caused by a niacin deficiency in the diet - although this was not confirmed until 1937. During the early part of the 20" century, pellagra was a terrible scourge among the poorer classes in the South. For endocrinological reasons, it affected women more than men. Laura was buried in Ayden, presumably with her husband. Laura's death and Oliver's marriage and departure seem to have presaged a downturn in the family's finances. They fell behind in their mortgage payments and in February, 1935, the Ellerbee Street house was sold in foreclosure to the Prudential Insurance Company. Gamely, William and Helen Cash bought the property back, but they could not make their mortgage payments either and, in June of 1936, they lost the house in a second foreclosure sale. In January, 1937, the Prudential Insurance Company sold the house to D.O. Waller and his wife, Esther. The Wallers would live in the house for thirty-five years. They raised three children there on his wages as a foreman at Liggett & Myers. Doctor Ottis Waller was born in Granville County in 1896, but he spent most of his life in Durham. He was not a medical doctor. Because of his unusual name, he went by “D.O." or "Otis.” He was known as "Doc" to his family and friends. His middle name is sometimes recorded as “Ottis” and other times as "Otis.” His younger son was named “Doctor Otis Waller, Jr.” Doc Waller married Mary Esther Edwards in 1916. According to his 1917 draft registration card, Waller was of medium height and medium build. His eyes were blue and he had light-colored hair. At the time, he was working in the shop at Durham Lumber Company. When the Wallers moved into the Ellerbee Street House, the house number was 109 Ellerbee. It would change to 111 E. Ellerbee some years later. The Wallers had three children: Thomas, D. O., Jr. and Helen. Doc Waller was already working at Liggett & Meyers in 1937. He made his career at the firm, retiring in 1961 after 37 years of service. Esther Waller was a homemaker. In their early years on Ellerbee Street, the Wallers also had roomers. According to the 1940, U. S. Census and the corresponding city directory, John Southard and his wife, Ruby, lived in the house with the Waller family. John Southard was a bookkeeper. Doc and Esther Waller lived out their lives at 111 E. Ellerbee Street. Esther died on August 23, 1971. In 1974, the Waller family sold 111 E. Ellerbee. The house at 111 is a typical side-gabled bungalow and has a central dormer gable on the front as well as side gables. It possesses many typical bungalow features. A wide front porch invites visitors to come and sit awhile. Tapered square wooden porch pillars rest on brick piers and the porch stairs are flanked with brick wing walls topped with molded concrete copings. Above, shallow gables have identical triangular knee braces. The house has large, double hung windows with four vertical panes in the upper sashes and half-size windows in the living room. The kitchen also has the four vertical panes. The large windows on all sides allow streams of daylight into the interior. The house has most of its original woodwork including baseboards, window frames, and stair banisters, as well as hardwood floors and beadboard ceilings. The interior doors have five horizontal panels. French doors once separated the living and dining rooms. Other details from original construction also remain, including door hardware, light sconces, and doorbell. The house did not have central heating when it was built. Fireplaces were designed to burn coal. Oil stoves also provided heat. The fireplace in the living room had the coal burning fittings until recently, but a crack in the floor of the hearth demanded updates for safety. Mantle details on the fireplace are original. The door at the back of the central hall has been walled off on the outside. It once led to a back porch where the homeowners could keep their icebox away from the heat of the stove in the kitchen. The exterior siding of the porch remains intact in what is now used as a laundry room. The kitchen was updated in the 1980s, but many original features remain, including the bead board walls and ceiling. The wide sink with its double drainboard echoes the style of the lost original. Doors have been kept in their frames even when the door opening has been walled off. Except for the modification of bathrooms and the back porch area, the floor plan of the first floor of the house remains largely unchanged. However, the upstairs at 111 was remodeled sometime before 1973. The open stairway in the central hall, with its square balusters and block-topped newel posts is original, but once led only to an attic. At the top of the stairs now is a small room under the central front dormer. Two bedrooms and a bathroom are at the back of the house. The addition of living space in the attic was probably initiated in the late 1930s when the Wallers had roomers in the house with them. The house has a deep, narrow backyard where the applicants do extensive gardening. If it is not contemporary to the house, the garage building was built soon afterwards. The owners have built a screened room against the side of the garage, with windows all the way up under the shallow half-gabled sides so their view of the garden is unobstructed.